Tata Sky has always been a pioneer in the DTH domain, whether it is giving the choose-and-view option to let customers choose what channels they want to watch or the recording facility so that consumers can record ‘live’ TV and watch it later. 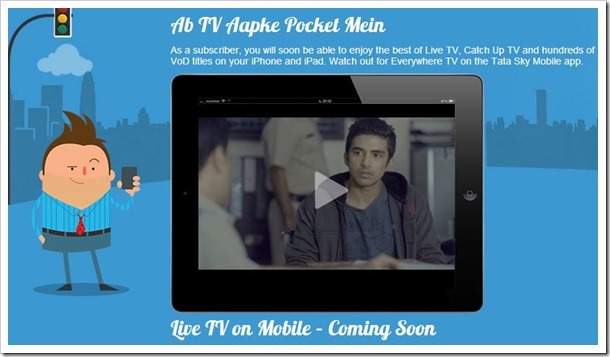 Now, they are launching a new application that allows watching live television programs on mobile phones as the company looks to monetize the rapidly changing trends of Indian consumers. Tata Sky says the app, meant for both Android and iOS, will be coming soon, and will be released during the festive season. After the digitization drive, this seems to be a good move. By the name of ‘Everywhere TV’, the iOS and Android mobile app will support a host of free features by paying a modest Rs. 60 per month to avail more than 50 different major English and Hindi channels. Later on, regional channels will also be included, taking the total number of channels to be offered to cross 200. Why TV on the go? Tata Sky Chief Commercial Officer Vikram Mehra says: The company had done research and found that the amount of time subscribers spend on commuting is 76 minutes every day. Most of the people travelling in train or by car watch some kind of video content on their phone. This shows that there is a huge potential for Everywhere TV. It was found that 88 per cent of subscribers had either a smartphone or tablet or both. Also, they have either an apple or an android in the smartphone category which makes sense to go ahead with this. New consumer base: Students who live in hostels will also be able to access this. A good 3G mobile or broadband connection or a wi-fi connectivity! Tata Sky is investing Rs 900 crore this fiscal on upgrading technology as it targets a 30 per cent growth in subscribers. With a number of telecom providers giving 3G speeds at cheap rates, this should not be a bother at all. Smartphone penetration is increasing day by day and mobile and tablets sales are overshadowing PC sales. With the entire world going the mobile way, it is a brilliant strategy by TataSky to ride this wave before competitors do. Looks like they have decided to make our life jinga lala. "Tata Sky Brings 50 TV Channels Live On The Mobile", 5 out of 5 based on 1 ratings. Sid… High resolution also means very high bandwidth…which is not actually that cheap!